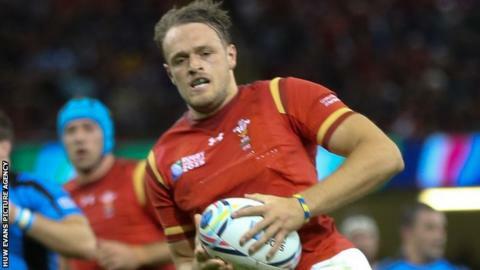 Wales centre Cory Allen has confirmed he will be out of action for 12 weeks with a hamstring injury he suffered in Wales' win over Uruguay. The Cardiff Blues player, 22, scored a first half hat-trick in the 54-9 win but was taken off in the second with a "significant" hamstring injury. He was subsequently ruled out of the tournament and replaced by Newport Gwent Dragons' Tyler Morgan. "The injury is a massive disappointment but these things happen," Allen said. "I had a scan the morning after which pretty much confirmed what everyone expected, that I'd torn my hamstring and there was also a grade three tendon tear as well. "I went up to London to see a specialist and his advice was that I have an operation. "I'm back off to London on Tuesday to have the op."